Those of you who follow me on Instagram might have noticed that Dan and I often wear Elliot, especially for walks, or around the house. What started as a passing interest during my pregnancy turned into a full-blown necessity when it became clear that Elliot loves to move and I was not strong enough to carry him around in my arms as much as he wanted. 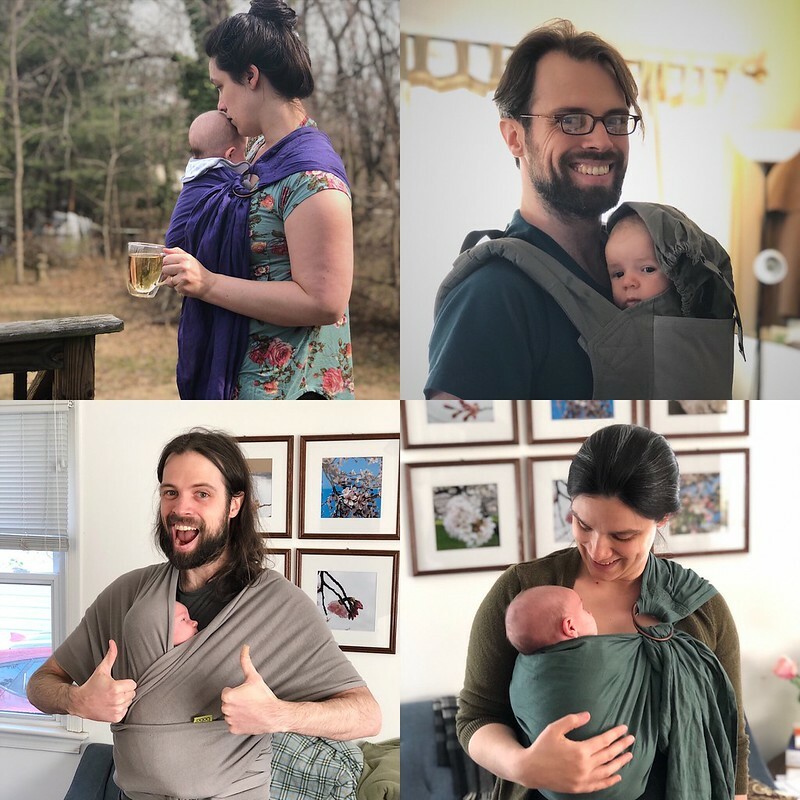 Since Dan and I have both gone through a few iterations of babywearing carriers, I thought I’d share our experiences and talk a little bit about the styles we each prefer. We started out with stretchy wraps, as many parents do. We were fortunate enough to be gifted both a Moby and a Boba wrap from some generous friends, and our doula helped us figure out how to tie the wrap during her postpartum visit. Dan was immediately excited about wearing the baby because it usually fell to him to walk Elliot around the house while I was recovering from my c-section. I was less enthused by the stretchy wrap because I couldn’t really handle anything around my middle without it causing pain for many weeks. So I got a ring sling. The ring sling was amazing because it puts absolutely no pressure on your abdomen, and, once I had a friend show me how to use it, I still find it the quickest way to get Elliot up and into a carrier when he’s being fussy around the house. I purchased two linen slings from Sleeping Baby Productions and I would absolutely purchase them again (I bought one, loved it, and bought a second when she had a sale on because I wanted a backup for when my first was in the wash). But my favorite way of wearing El for longer periods of time, such as our daily walks, has got to be the woven wrap. It is, of course, one of the more expensive ways to babywear, but I found a beautiful 100% cotton woven wrap from Little Frog for under $100, shipped from Poland. I use this wrap in a simple front wrap cross carry for all our outdoor walks now. 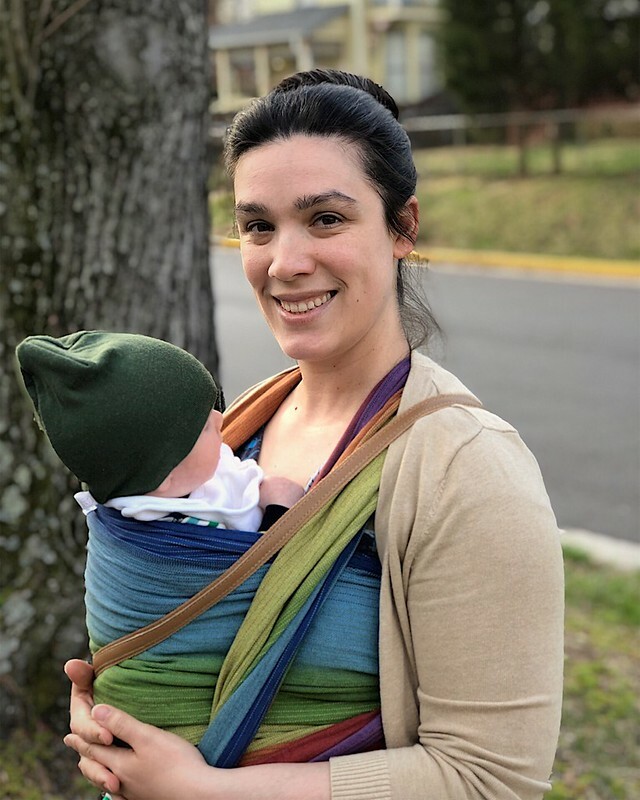 The wrap is supportive enough that Elliot doesn’t try to kick out of it like he sometimes does with the ring sling, it distributes his weight evenly across my back so I don’t end up with a tweaked back, and the woven material doesn’t sag or stretch out as we walk. And they’re super gorgeous. We both decided that we don’t love the stretchy wraps. The stretch makes tightening a bit more forgiving, but that also means that they sag and feel less supportive. I once went on a walk with El in the Moby wrap and by the middle of the walk, his wiggling had stretched out the wrap to the point where I basically had to carry him home. Dan decided he prefers a soft structured carrier. We got him a Boba 4G, which he wears around the house in the evenings. Since we’re different sizes, I let his carrier be his (plus, I tried it once, and I’m not a huge fan of it). So those are our favorite babywearing methods. I’m looking forward to experimenting with more carries with my woven wrap as El gets bigger and more developed. And maybe I’ll treat myself to another woven wrap sometimes (or ask for one for Mother’s Day! ).